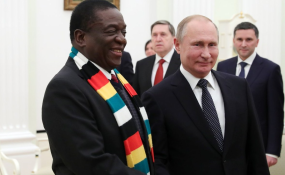 President Emmerson Mnangagwa meets Russian President Vladimir Putin. President Emmerson Mnangagwa has defiantly dismissed as "dreamers", Zimbabweans who have criticised him for his often expensive but unproductive foreign jaunts. The Zimbabwean leader is out to Russia on the first leg of a tour that is set to take him to Belarus, Azerbaijan, Kazakhstan and Davos, Switzerland. He is cruising on a luxurious Boeing 787-8 Dreamliner aircraft government chartered at a cost US$74 000 per hour for his five nation trip. Political opponents back home have dismissed his tour as waste of scarce national resources amid claims the excursion had no economic benefits to his troubled country. The MDC has likened Mnangagwa's current hunting expedition to the many the national leader has embarked on before with no tangible benefits to the country. In an interview with journalists in Russia, Mnangagwa accused his critics of dipping their "heads in the sand" and choosing to ignore the benefits that have accrued out of his previous trips. "In a democratic country like Zimbabwe, people are allowed to dream; people are allowed to criticise and no one will lose sleep because of such negativity about some of the people who specialise in criticising." He added, "Unless you are not doing anything, then be criticised. "As long as you are doing something, then you find people criticising. Then that makes us in government feel good because we are doing something." Mnangagwa began his tenure as the country's number one with tours to various countries while pushing his "Zimbabwe is open for business mantra". The country is yet to feel any positive impact from the expensive trips. The Zimbabwean leader was at pains to list some projects he said were yielding some benefits to the country. These, he said, included the US$1.3 billion deal sealed with the Chinese for the Hwange Thermal Unit 7 and 8, the US$154 Robert Mugabe International Airport and the $4.5 billion Zimbabwe and Zambia Batoka Gorge hydro scheme. "But look the progress we have made now within 10 months... and you say there is nothing happening and then you sit and listen to such nonsense; when facts are on the ground for those who would want to see. "All those projects are there for people to see but we have people who have their heads in the sand."